Spring 2017 marks the fiftieth anniversary of the formation of the '77 Italian social-leftist movement Autonomia Operaia. 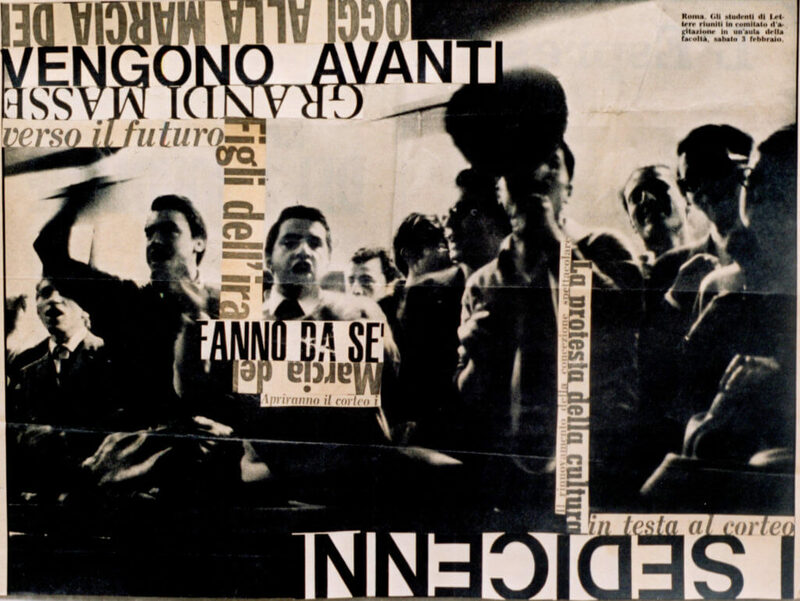 More than any other social movement, the Autonomisti placed art at the foreground of their activities - explosive protests by students, migrants, and the unemployed against a work-based society. The dazzling body of work created is helpful even five decades later for dislodging the ‘stuckist’ mantra of contemporary art. Today’s ongoing debate about the relationship between art and activism is one that too often seems to arrive at a dead end. These two grand abstractions – too grand, too abstract perhaps? – seem to repel one another with an almost magnetic indignation. The possibility of fusion is frustrated by difficult questions, the reductiveness of political language, the vulgarity of propaganda, the sheer ugliness of naked ideology. Few can claim to have confronted and surpassed this dilemma more effectively than the writer and artist Nanni Balestrini whose poetic craft has, for decades, been intimately embedded in the realities of Italian social movements. His art was born from a particular set of struggles that emerged in the 1960s and 70s, most notably the wave of protests and occupations that would lead to the formation of Autonomia Operaia, a leftist movement which challenged the Communist glorification of work. This disparate group, too often reduced to its concluding apocalyptic violence, has been largely abandoned as a strategic political model. But it is in the artistic sphere, and in Balestrini’s poetic work in particular, that the imaginative legacy of this generation lives on in its most vivid and urgent manifestation. It is a pastiche of the epic, a meditation on the collapse of movements, the loss of hope, community and love. One of the most important examples of this, and the most interesting for both artists and activists today, is Blackout, first published in 1979 and, as of this week, now finally available in English translation thanks to Commune Editions. The text is a perfect example of how literature can expand outside of its usual social boundaries: the private space, the isolated ‘intellect.’ The poem – split in four ‘chapters’ – tells the story of the movement’s birth to its final moments, the dark days in which the ‘lights’ went out. It is a pastiche of the epic, a meditation on the collapse of movements, the loss of hope, community and love. Each phrase asks the reader to speculate as to its origins, each contains its own individual energy or aura. ‘A segment of Milan is deadlocked’, for example, reeks of journalistic detachment, made all the more obvious by its strange amputation here. Meanwhile, the poster which ‘illuminated’ the walls of Milan has a romanticism, youthful and futuristic. Then there is the ‘glimmer of light,’ in heaven, opposed, of course, to the blackout of the poem’s title. ‘Could this be from the Gospels?’ asks the reader. The images of protesters seem tangiable, animated, emerging from darkness as if through a cloud of smoke or tear gas which characterised those demonstrations. There’s that ‘river of blue jeans’ again, but this time it’s attached to the physical images of a crowd, surrounded by ‘shoulders of heads and arms’ and ‘hundreds of thousands of voices.’ It is a powerful, audio-visual device. The images of protesters seem tangiable, animated, emerging from darkness as if through a cloud of smoke or tear gas which characterised those demonstrations. Repetition here is used to draw attention to the synchronicity of experience – the multiplication of demonstrations – almost like the clarinets of Steve Reich’s New York Counterpoint jutting in and out of one another. Many of these themes resonate with today’s ‘European crisis.’ We read about feminism, homophobia, post-industrial economics, about young people who “come from another planet”, cities “disrupted by immigrants dehumanized in the ghettos where the quality of life is tragic.” But it is the collection and collision of these issues, approached from different angles, spoken in different dialects, that is most significant. Balestrini himself seems virtually absent, present only the space between lines, in the silences. The voices of the poem are subsequently able to develop a kind of autonomy, a chorus constantly shifting in rhythm, intonation and emotion. And so on. Balestrini’s organisation of these fragments engenders a poetics that is polyphonic, multi-vocal, and embedded in a specific time and place. The cold factory instructions for example, the ’85 ton cylinder,’ obtain a new meaning in the poem, become connected with mass media, with the language of crowds and, ultimately, with the movement itself. This is collective narration, where the job of the poet is to assemble voices rather than express a single, mysterious, idea. The cut-up public discourse – the image of the cinema, an audience – is deployed to divert ‘spectacle’, forging a remarkable empathy with the unnamed protagonist who the reader has only just encountered. The emotional rhythm appears intimate precisely because of the ambiguity and inherent distance of the source materials. So while the cold logic of Balestrini’s assembly line is still there – the rigidity of prison bars, welding machines, the confines of the sonnet and villanelle – here it is used not to depersonalize but quite the opposite, to give flesh and bone to the figure described. Their punishment, like that of the poet’s friends, is negated through a language that transcends rigid boundaries, violating the rigid divisions between ‘inside’ and ‘outside,’ enacting, in other words, a prison-break. Balestrini’s particular techniques of appropriation, assemblage, and rhythmic assault are a unique intervention in poetry, a radical evolution of the avant-garde cut-ups pioneered by earlier artists like Jean Arp and Vladimir Mayakovsky. But while Surrealism, Dada, Zaum all sought psychological liberation, Balestrini, inspired by the politics of autonomia, calls for a renegotiation of the binary between individual and collective, in which society itself is reconstituted by poetic logic. What would such an experiment look like today? Perhaps a 21st Century response to Blackout would recompose Internet fragments, juxtaposing election manifestos, tweets, scientific surveys and blog posts. Or perhaps it would intervene against finance, jamming stock market argot with the slogans of occupiers, the rhythms of graffiti. What Balestrini’s poetry proposes is a poetics in which concepts like democracy and justice evaporate altogether, hollowed out by history. At the core of Balestrini’s poem is the idea that while machines have revolutionized society, their alienating power must be reclaimed by the artistic energies of social movements: a multitude. In a recent Talk Real interview Maria Hlavajova spoke about art’s capacity to “add affects” to “concepts we need, like democracy and equality.” The idea is a neat one, but too one-directional. What Balestrini’s poetry proposes is almost the opposite, a poetics in which concepts like democracy and justice evaporate altogether, hollowed out by history. While the consequences of this are dire, violent, he suggests there is a unique opportunity to build something new, something eternally suspicious of abstraction. A true humanism, perhaps. The translation of Blackout is a quiet event and one that will be destined, for now at least, to remain in the corners of both the activist and literary worlds, so separate, so seemingly irreconcilable. Today’s social movements, lacking in institutional power, are far from the point of canon-building. Nonetheless, for both its historical ambition and formal inventiveness Balestrini’s work remains a vital resource for individual artists seeking to escape the paralysed aesthetics of the contemporary art world.